Nice for events, has a large variety of dishes and even a wine list. Carbonara or any of the pizzas listed are awesome (I visited a couple of times). Some of the dishes listed could seem a bit pricey but that is only because the ingredients are imported (or so it seems so). Staff is friendly and they have a smoking area too. Good service and the food was tasty if you can skip the stained table cloth. The prosciutto i fungi pizza was very good . The place is quite small but good for a quick bite. 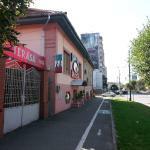 the restaurant is located close to the city center,on a main road near the Medicine University. The food is good and tasty and the stuff is friendly. I recommend this place if you want to eat something good and fast. Business lunch is very nice there. For 15 RON you will get soup, main dish and desert. Quality and service are good everyday. The pizza is good, pasta as well. We tried a few different other dishes and they were ok, what I didn't like was the fritto misto, too oily and the batter wasn't tasty at all. The service is good. Been to Restaurant Aragosta? Share your experiences!